As promised in AbeNW11's post on Making 2,000 Year Old Bread  this is my now thoroughly tested recipe for the Pompeii loaf. 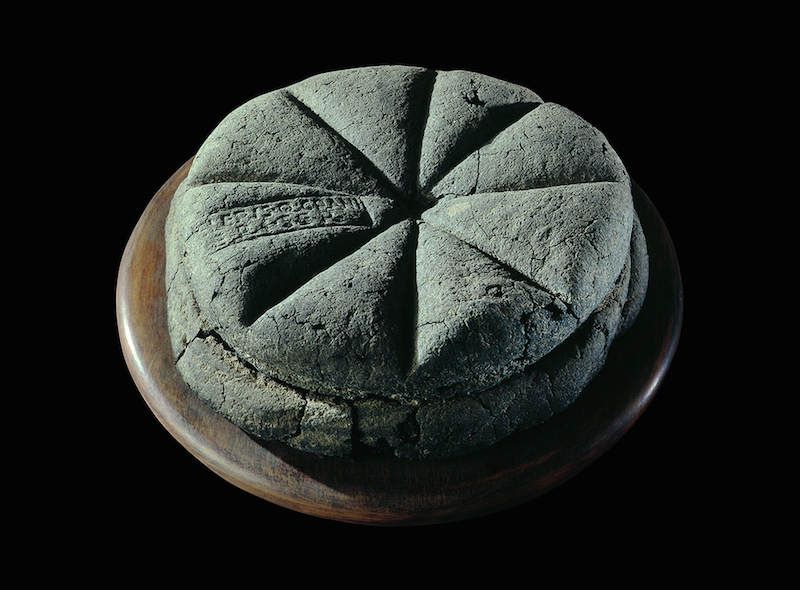 For those of you who don't know the back-story, when the Pompeii Live exhibition was staged at the British Museum in 2013, one of the items on display was a carbonised loaf of bread found in a bakery oven. On the day of the eruption in 79AD, it received a slightly longer and higher temperature bake than the baker intended. Not that he cared any longer. Apart from surviving the eruption, the loaf is notable for three things. There’s the bread stamp on it which reads ‘Property of Celer, Slave of Q. Granius Verus’. It is also wrapped in a cord . And it’s divided into eight wedges. The museum asked chef Giorgio Locatelli to recreate the bread. And you can watch him and his kitchen staff doing just that on this video here . It’s fascinating stuff but, viewing it, my reaction was that this is was a restaurant loaf, one made using modern techniques (yeast, gluten powder etc.). Why not have a go at making a true artisinal loaf instead and have a go at baking it wrapped in a cord? Here it is. It’s a whopper. Out went the modern flour, yeast, and gluten additive. In came a sourdough preferment, ancient flours, and artisinal techniques to develop gluten. I used Kamut, rye, and spelt flour; all grains common in the Roman world. I suspect Prof. Calvert was not the first person to come up with the idea of autolysis. After all, bread-making’s been around for eight thousand years. Many, many bakers must have noticed the benefit of giving hydrated flour a rest, so an autolyse was in. The same applies to double-hydration. I used a 100% hydration dark rye sourdough starter, but any will do (however, you do need to adjust the water quantity if you use a lower hydration starter). Although it makes a delicious, nutty-textured bread, Khorosan is horrendously expensive, so I tried the miche with varying proportions of all the flours, including replacing the Khorosan with wholemeal/wholewheat or buckwheat. All worked very well. 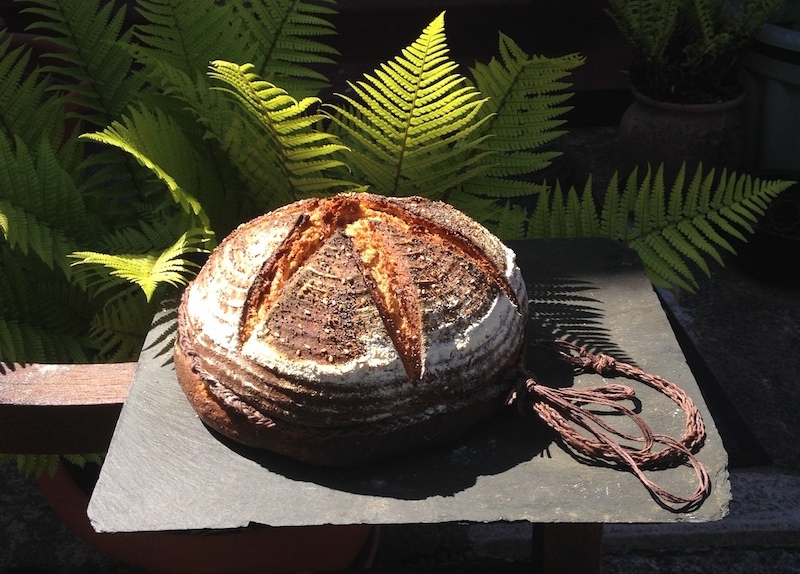 The recipe is adapted from the ever-reliable Weekend Bakery's Miche formula  and is is therefore fairly disaster-proof. I sprinkled the loaf with anise, poppy, and sesame seeds because it’s known they were used by Roman bakers and because I like the their taste. Here’s the obligatory crumb shot. PREFERMENT: Mix the ingredients for the preferment together into a stiff-ish dough and leave at room temperature (18-24℃ - 65-75F) for 12 hours or overnight. MIX. When ready, and if you have a thermometer at hand, determine the Desired Dough Temperature (I aimed for 25℃ - 77F) and adjust your water temperature to achieve it. Stir the preferment into half the water. Add the flours and stir to incorporate. Gradually add the rest of the water and let the dough come together (you may need all of the water or even a bit more, depending on the flour you use). If you can, reserve 10% of the water for later double-hydration. KNEAD: Knead for 1 minute into a shaggy mass. AUTOLYSE: Cover and let the dough rest for 30 minutes. KNEAD: Add the salt and knead for 3 minutes on a stand mixer (5-6 minutes by hand). KNEAD: Continue until you achieve a good window pane (with these flours it’s never going to be great). BULK FERMENT: Return to a greased bowl and let it rest for 50 minutes. FIRST S&F: Wet your hands and, either do one complete stretch-and-old turn in the bowl, or tip onto a floured work surface then do one stretch-and-fold. Return to bowl, cover, and leave to rest for 50 minutes more. SECOND S&F: Repeat and leave for another 50 minutes. THIRD S&F. This is optional depending upon the strength of gluten development in the dough. 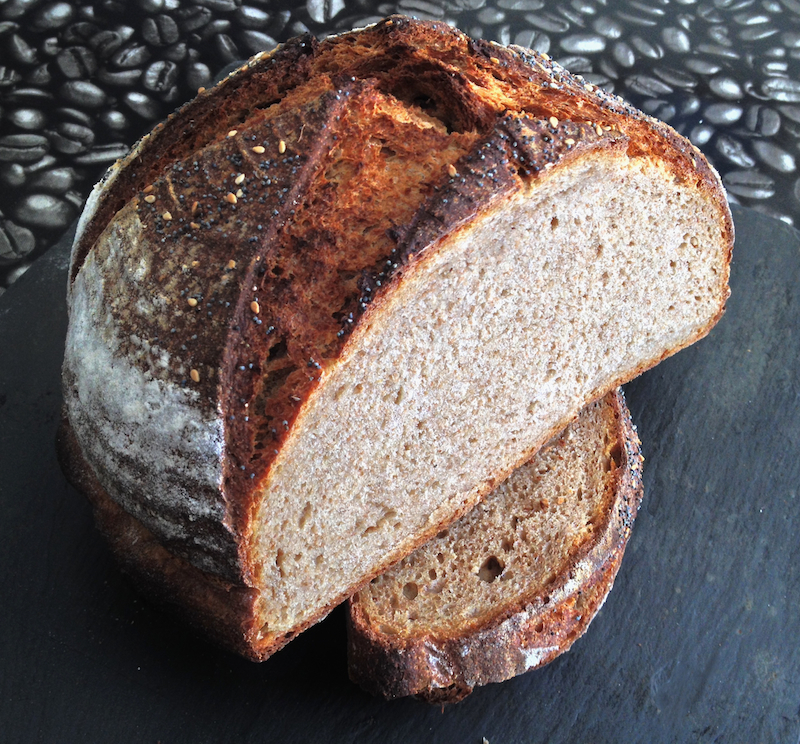 When I replaced the Kamut flour with either buckwheat or wholemeal it was needed. PRE-SHAPE: On a lightly floured surface, gently de-gas the dough, tuck the edges into the centre, flip over, then, with floured hands (the dough is quite sticky), drag it into a loose boule in four quick turns, making sure not to overwork it. Cover with a damp cloth (or similar) and let it rest for 20 minutes. Prepare a large (1.5kg) banneton. SHAPE: Lightly flour your surface and hands again then shape the dough into a tighter boule, making sure not to tear its skin. It’s a big loaf, so you’ll need to use both hands and/or a bench scraper to do this. Make sure you flour your hands again if they begin to stick to the boule. Sprinkle the top of the boule with flour, gently turn it upside down, then carefully place it in the banneton. PROVE: Cover again and leave to prove for up to 90 minutes. Precise time varies with the ambient temperature. When you think the bread has risen enough, use your finger to carefully make a very small dent in the dough. If after 30-45 seconds the dent remains, the bread is ready to bake, if the indentation disappears, the dough needs a little bit more time. Preheat your oven to 225/205(fan)ºC (440/400F). When the loaf is ready, turn the oven up to 240/220(fan)℃ (465/430F). Prepare your steam tray. Carefully turn the miche onto your baking peel. Spray it lightly with water then sprinkle on the seeds. Dust your peel with flour then turn the boule onto it. Tie the cord around the loaf, knotting it to make a carrying loop from its tails. SCORE: Make four cuts from rim to rim across the centre to create eight segments. You need to slice down to the cord. I used a sharp bread knife to do this; my lame was not up to the task. I’ve also cut it some loaves into six wedges rather than eight. Either way is good. BAKE: Slide the miche into your oven and immediately turn the heat down to 225/205(fan)ºC (440/400F) and bake for 50-75 minutes until dark brown. Remove the steam tray 30 minutes into the bake. When baked, transfer to a rack and leave to cool. Okay, why the twine? First, as you can see from the bread selfie below, it helps you carry a whopping 1.7kg miche. Handy for the Roman shopper/house slave. Then there’s the division of the loaf into wedges. They’re deep cuts but, if you tie the cord around the loaf first, the miche keeps the shape it would lose if it was sliced without the cord. 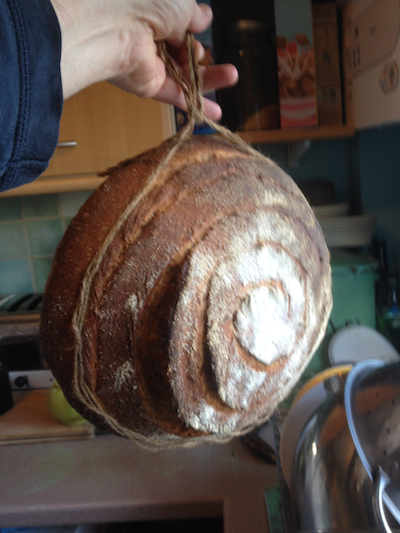 I baked my first Pompeii miche using a cord made from garden twine. It worked well but left hairs embedded in the crust. Not so good. I tracked down some 20lb hemp cord which comes lightly waxed with corn and potato starch. To make a cord thick enough for the miche, I cut three lengths, wove the strands together, repeated the process twice more, then braided the three-ply cords into one strong 9-ply cord. Problem solved. Why the wedges? No seems sure, but the simplest explantion is that the loaves could be sold or served by the slice, just as some miches are sold in France today. I’ll have a go at my next farmers' market. And the bread stamp? 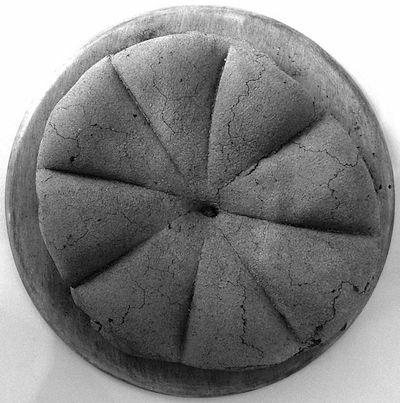 Roman bakers didn’t just sell their own bread (like the unstamped Pompeii loaf above). For a fee you could have your own loaves baked in their ovens (a communal tradition that only recently died out in France but survives in Morocco - read Bill Alexander's superb 52 Loaves  for more) hence the need to identify which loaf was your own. Bread stamps have been much discussed on TFL . I’ve yet to decide how to make mine, but I will. 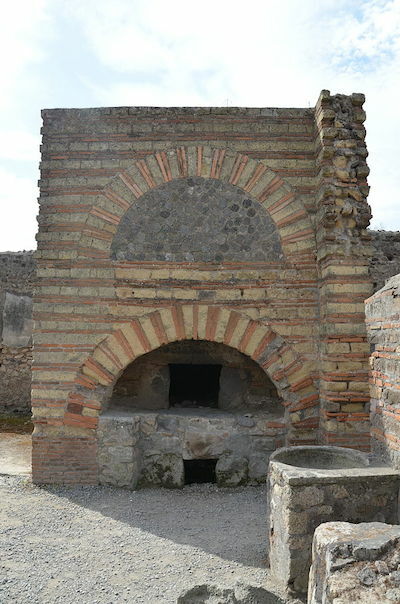 More than thirty bakeries have been excavated in Pompeii and Herculaneum. Almost two-thirds were large enough to have their own donkey or slave-powered flour mills. They also had communal ovens to which you could bring your dough (bread-stamped, of course) to be baked overnight. 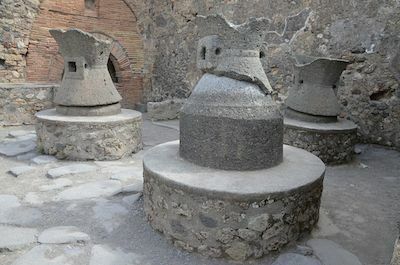 Ironically, basalt rock from old lava flows was used to make both the millstones and the floors of the wood-fired ovens. Despite the devastation of the eruption, quite a few loaves have been found. Eighty charred loaves alone were recovered from the ovens of one baker, Modestus. Their (ultra) dry weight is 580g on average, all were divided into six or eight wedges, and each has a diameter of about 20-25cm. Luckily, about the size of a 1.5kg banneton. 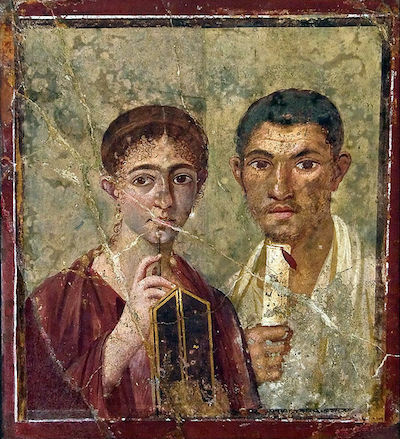 And here’s a portrait of another baker, Terentius Neo, and his wife. It's a fresco from inside their house in Pompeii. He holds a scroll, showing he was literate. She holds a wax tablet, showing she was numerate too.